Before reading on, please note, many disabled students need a bendy plastic straw in order to independently consume fluids. Please ensure that you have a stock of bendy plastic single use straws behind the bar, so that if requested, they can be given to those that need them. We advise putting a sign up on the bar to make sure that disabled students know that they are available. Do not attempt to police who has access to plastic straws. 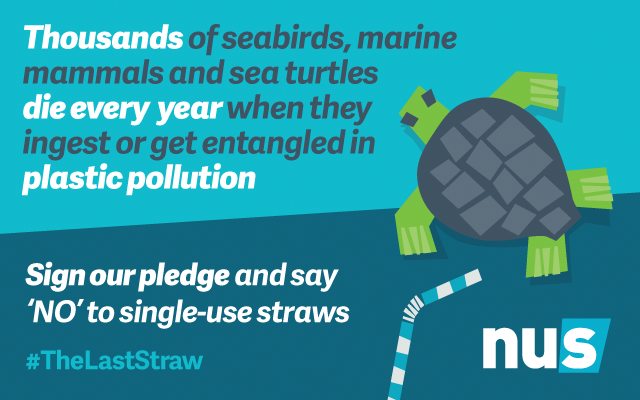 Removing access to plastic straws may make you liable under the Equality Act 2010. You’ve probably already heard that many bars and restaurants are joining the global movement to reduce plastic drinking straws from our landfills, streams, oceans and beaches. They are used for an average of 20 minutes, but their effect lasts a lifetime. Extreme waste for minimal convenience! Thousands of seabirds, marine mammals and sea turtles die every year when they ingest or get entangled in plastic pollution – 80% of which comes from the land! If you're an SU, keep a stock of reusable or compostable straws behind the bar just in case your customer requests one. There may be instances where you need to stock plastic straws i.e. some disabled customers may require one, so try and ensure these are recycled responsibly (see related articles below). See if there are local environmental organisations that you can work in partnership with. The Students' Union at Bournemouth University is a great example where a team of student volunteers (The Green Taskforce) and VP Education Alex Hancox, will be working with Litter Free Coast & Sea this year to lobby the 18 kiosks and food outlets on Bournemouth beach-front, to ask them to change their single use vending plastics. We'll tell you more about this soon. As students, you have the power to drive meaningful change. Phasing out single-use plastics – where possible – in our day-to-day lives by considering our impact on the environment with items such as straws, plastic bottles and bags is the first step. Click here to find out more from the sustainability team at NUS and to join our sustainability mailing list. Who has signed the pledge so far? 909 individuals have signed the pledge so far including these students' unions and envrionmental organisations. THANK YOU! Has London got the bottle for water fountain rollout? It's great news to hear that the UK Government has banned the use of microbeads in costmetic products from 1 January 2018 with Wales to follow shortly. By 1 July 2018, all personal care and cosmetic products containing microbeads will be off the shelves in the UK and the US. The Evening Standard launched a new campaign to eradicate plastic straws from London's streets. Read more here. This year, NUS will be committing to using reusable cups as part of our coffee cups campaign. Following the news that only one in 400 cups are recylced in the UK - it's time to act!